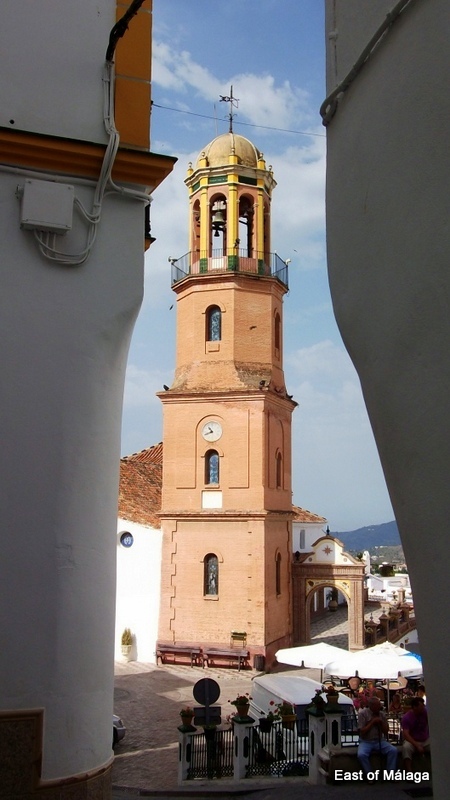 This is a view of La Iglesia de Nuestra Señora de la Asunción (Church of Our Lady of the Assumption) in the central village square of Cómpeta, taken from between two of the nearby white-washed houses. Built in 1505, the church´s golden dome can be seen for miles around, dominating the village. To the right of the magnificent tower, is El Paseo de las Tradiciones (The Walk of the Traditions), completed in 2009 on the site of the old municipal market. You can also see two of the many white umbrellas offering a shady place to eat or drink at one of the cafes in Plaza Almijara, whilst being overseen by some of the old men of the village from their seated position overlooking the square. Other photographs I love … and why! This entry was tagged Andalucía, Cómpeta, photography, Spain, travel. Bookmark the permalink. Thanks – I appreciate your comment. I particularly enjoyed capturing this image. It seemed to add another dimension with the addition of the old village houses on either side.